As September is coming closer, all of our expectations for Apple’s new flagship device are highly increasing. Know all about iPhone 8 in today’s story. Curious to know what will the upcoming models of iPhone have in kitty for its users? After monitoring and covering all about iPhone 8, we are sure that this most-awaited launch by Apple will make this year’s September super-special. Can I Afford To Buy It? Because of premium features and marvelous specs in iPhone 8, its price may go a bit higher than that of iPhone 7. Bringing it to your concern, the starting price of iPhone 7 was £599, while the price of iPhone 8 basic model may start from at least £650. However, the model with the largest memory support may be priced at £1000. As the price of iPhone 7 was set different for different countries, same can be the case of iPhone 8.
iPhone 8 will have a flat 5.8-inch screen rather than the rumored curved one. The minimal glass bezels curving around the sides will create illusion of a curved display. And the presence of AMOLED display instead of LCD ones will further lead to increased brightness, and beautiful color effects. While for iPhone 9, Apple enter in to an agreement with Samsung for getting OLED displays. Though Apple has not confirmed yet about its September launch, we have predicted it to be true based on its previous smartphones’ launch that usually takes place in September only. As per rumors, Apple will introduce three powerful versions in the form of iPhone 7S, iPhone 7S Plus and iPhone 8 this year. 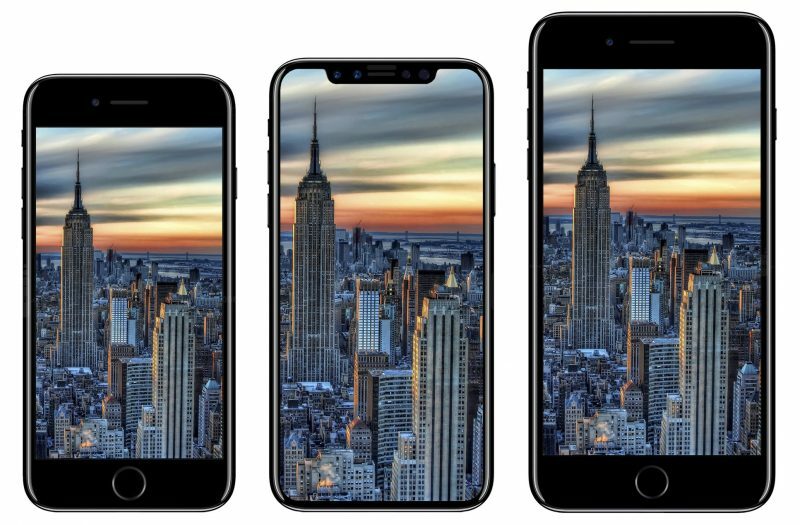 Unlike its previous launches, Apple may release these 3 versions all at once. That is gonna be a triple-treat for iPhone lovers. We are confident that iPhone 7S and iPhone 7S Plus will roll out this September anyhow. But we cannot predict the same for iPhone 8. It’s possible that the company releases the new-numbered model after the whole excitement and enthusiasm among its fans vanish away. Anyways, you can lay hands on all these 3 models in 2017 itself. How Different the Design will be this time? iPhone 8 will replace its signature aluminium back with a curved glass back panel. There will be stainless steel metal frame, but headphone jack and home button may not be there in upcoming model. It is highly possible that the whole phone will be based on touchscreen concept. Making the smartphone bear a little more water than before, iPhone 8 may get an IP68 water-rating instead of IP67. iPhone 8 will keep pace with its vertically aligned dual rear camera having a front camera of 8MP and a rear camera of 12MP. It is rumored that Apple may introduce Augmented Reality feature in its cameras which provides you relevant information about the object you point towards. We’ll see the brand new A11 chipset along with iOS 11 update in iPhone 8. The rumors of iPhone 8 having 2 batteries don’t seem to be true. To solve the battery problems of several iPhone users, Apple may include a bigger battery for its new flagship device. That was all about iPhone 8 so far, and we hope that this information helped you in finding out what to expect and what not to expect in iPhone 8.